When I was learning gradually about my Country’s history, culture, traditions and my fellow Filipino’s lives, it became so addictive for me that I realized, I want to discover and explore more of the Philippines, that I want to learn more of the hidden mysteries and magnificence offered by my own Country because I was just so fascinated and intrigued by it. From there, I developed these idea and advocacy that I want to visit the places that are not yet popular and undiscovered so that I could help promote Philippine tourism, so that people from foreign lands would see how captivating and fruitful our Country is and they would plan a vacation to visit the Philippines thus, creating and increasing more jobs for our fellow Filipinos. 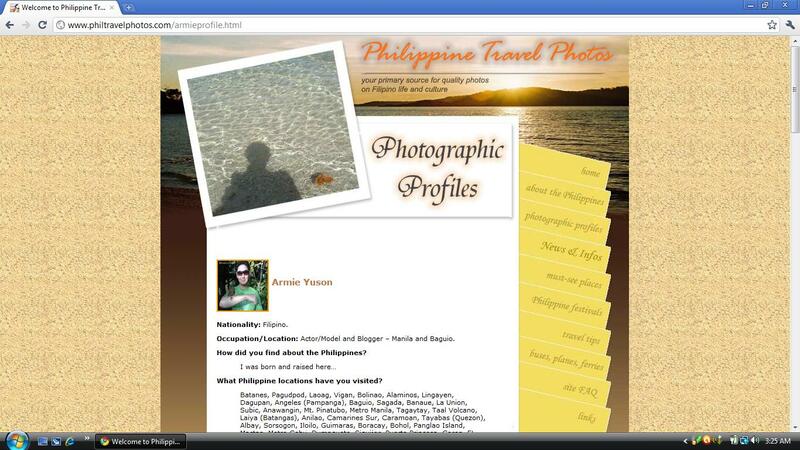 Thank you to the owners and creators LAR DE LOS REYES and LIZZA of PHILIPPINE TRAVEL PHOTOS for featuring me in their website. It’s such an honor for me to be a part in promoting our beloved PHILIPPINES!! !